Standing before them at Indiana Aerospace University’s (IAU) 24th Commencement Exercises on March 24, 2017, Guest of Honor and Speaker and Civil Aviation Authority of the Philippines (CAAP) Director General Jim Sydiongco told the 600 plus graduates to serve your country with all pride and honor. 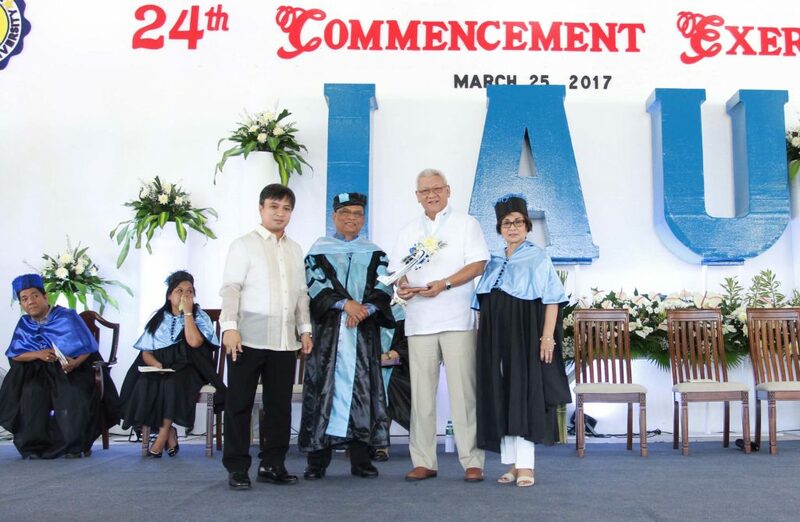 Sydiongco, an accomplished pilot and holder of an international degree, encouraged the graduates to excel in the fields of aviation and aerospace science and help the country become a premier center for aeronautical and aerospace science. With the surge of travel and tourism, there is an increasing demand of aviation personnel from mechanics to pilots and even airline operators. Hence, he also earmarked IAU’s significant contribution to produce aviation professionals whose caliber is par excellence. Over the years, IAU has lived up to its aspirations as the country’s only Aerospace institution with a student population close to 3,000. It has offered a number of programs such as Bachelor of Science in Bachelor of Science in Aviation Technology (major in Flying), Bachelor of Science in Aviation Maintenance Technology (BS AMT), Bachelor of Science in Aviation Electronics (BS AVT), Bachelor of Science in Aerospace Engineering (BS AE), Bachelor of Science in Travel and Tourism Management (BS TTM), Bachelor of Science in Airline Management (BS AMGT), Bachelor in Elementary and Secondary Education, Diploma in Professional Education and Master in Educational Management. Recently, the school has been accredited as the site for the CAAP Aviation Skill Licensing Examination to cater to aviation graduates who hail from the Visayas and Mindanao for their convenience and accessibility.